This is one of the best restaurant ads I've ever seen. 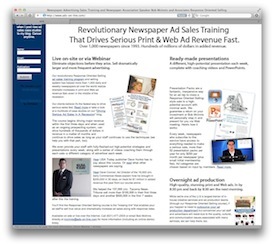 It has a great headline and graphic at the top to grab their target customers and get them reading. It also shows lots of selection and gets into detail about the quality of the food as well as price--three things their target customers feel strongly about. In addition, the images themselves reinforce the quality. Using our ad sales and ad strategy techniques, the Coeur d'Alene (ID) Press made a sale to a Japanese restaurant--two broadsheet half pages per week for a year. The ad itself was so successful they had to turn people away the very first time it ran. This kind of ad can easily be adapted to almost any restaurant in your market and should be part of every ad rep's tool kit. Of course, while the strategy is excellent, convincing the advertiser to actually run it and keep the suggested size, frequency, and content--that's where our approach really shines, and what separates a good ad rep from a fantastic one (see post Is Your Local Ad Staff Killing Your Newspaper?). After this restaurant experienced difficulty getting a response with an ad produced by a local ad agency (which was a little light on the benefit and substance), the ad rep got to work using our Response Oriented Selling techniques, by first eliminating any incorrect theories the advertiser might have relating to ad response, including size, frequency, and content and replacing them with a more effective approach. This changed the dynamic of the sales call, enabling the ad rep to get some detailed information about the account's products and services, competition, and target customers. He then applied our logical process for converting the information into a killer direct-response ad strategy which he then passed through to the designers to make look better, which they certainly did. 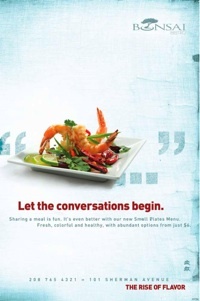 Returning to the restaurant and presenting the ad is typically the easiest part, since the prospective advertiser has already bought into the ad effectiveness techniques that the ad uses. And since both the information and the approach to arrange the information was drawn out of the account, the ad rep was able to prove--before the ad ran--that the final recommendation of size, frequency, and content would provide a dramatic response. It was a truly win-win situation. Another success story. This restaurant's sales have been down for over a year. We made a McInnis presentation to them and they saw immediate results with the attached ad. After the first ad they had to turn people away the day the ad came out for lunch and had record days the two days following. They signed up for two half page ads per week for a year. I can't begin to thank you for your logical sales approach program. After a while, too many ad reps start believing current and prospective advertisers when they say larger ads are too big a risk and simply unaffordable, especially in this recession. The reality is, if they actually run the right ad, including the right size and frequency, they'll get a tremendous response, and thank you for encouraging them to do it. You may even make a few bucks out of the deal.